BANGKOK (Thomson Reuters Foundation) - Families hit by Nepal's recent earthquakes risk losing their babies to hunger and disease over the next year unless they receive long-term help to boost their incomes and rebuild their homes, experts said. United Nations food security expert Jeffrey Marzilli said he feared a huge toll of "deaths from economic deprivation" after the Nepal earthquakes which killed about 8,800 people in April and May. Aid agencies and governments must provide sustained support, he said, citing research in the Philippines that found a spike in the number of babies who die up to two years after a typhoon because families divert money from paying for healthcare and food, to restoring their homes and livelihoods. "We're usually more focused on getting in right away and getting out quickly, so as not to cause dependency or interference in other ways," Marzilli, a Bangkok-based adviser for the World Food Programme, said in an interview with the Thomson Reuters Foundation. "You have to keep people alive not just at the beginning, but you have to make sure the decisions they're forced to make to rebuild don't have an unintended impact on their children. "When households lose so much, and they are so poor to start, it takes a long time to rebuild that roof, to rebuild that house, to re-buy that motorcycle or ... whatever livelihood asset they were using to stay above the poverty line." The U.N. has appealed for $422 million to provide emergency aid for 2.8 million people affected by the earthquake in Nepal, but has received only $127 million so far, or 30 percent of the funding. Economists conducting research in the Philippines found incomes dropped an average of 6.6 percent after a typhoon season, and household spending dropped 7.1 percent. Their findings were based on three decades of typhoon data and government health and expenditure surveys. Families particularly cut spending on medicines, education and high nutrient foods such as meat, dairy, eggs and fruit, the researchers wrote in their working paper published online in 2013. The average number of reported deaths per year in the typhoons analyzed from 1979 to 2008 was about 740. But the researchers found approximately 11,300 babies died before their first birthday because family finances were crippled in the aftermath of typhoons in the previous one to two years. All the babies were girls according to their analysis of the government data. Jesse Anttila-Hughes, a professor of economics at the University of San Francisco and one of the authors of the study, said he was surprised that only baby girls were affected. He said it could be linked to breastfeeding practices after a typhoon or possibly parents' belief that girls are more resilient. He added that the post-typhoon infant mortality effect was "very strong" and is likely to occur in more recent disasters, such as Typhoon Haiyan which killed 6,000 people in the Philippines in 2013. "It's highly likely that it would hold in Typhoon Haiyan. It's the same context, the same phenomenon ... I'm almost certain you'd be picking up this kind of an effect," Anttila-Hughes said by telephone. 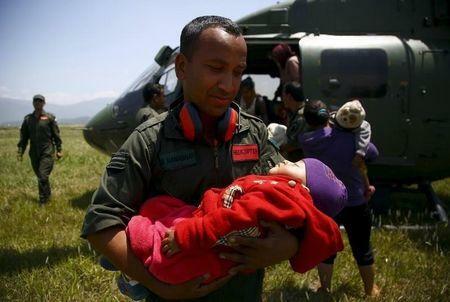 Disasters cripple families' finances unless they receive sustained help to rebuild, he said. He added there was a perception that when a disaster happens, "the crews come in" for the emergency phase and then leave, saying that they did their job. "No, you didn't do your job," Anttila-Hughes said. "These big disasters are dynamic events. You can't go in and just tidy up things and everything's okay." Marzilli urged governments to build social safety nets for longer-term sustainability and improved food security. "The effect of the earthquake in Nepal will play out over the next number of years, with a larger spike in deaths coming (18 months after the quake), if these big data studies hold to be true," he said.